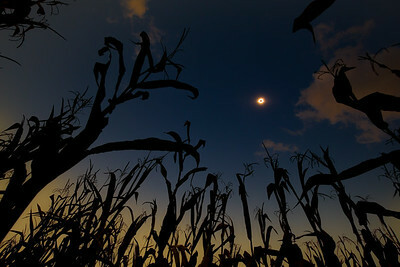 Total solar eclipse as seen from a low country corn field. 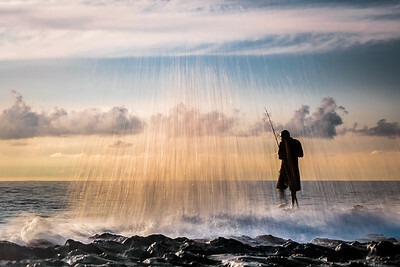 Fisherman on an early Sunday being baptized by large amounts of warm ocean water-from the Heavens. 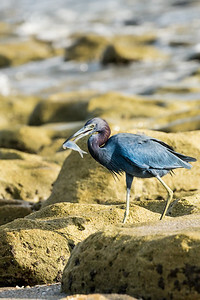 How might that be?-is what makes this photograph so unique. 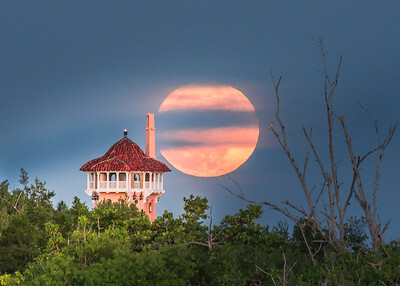 The Tower on President Donald Trumps Maralago Palm Beach estate behind a mangrove island. 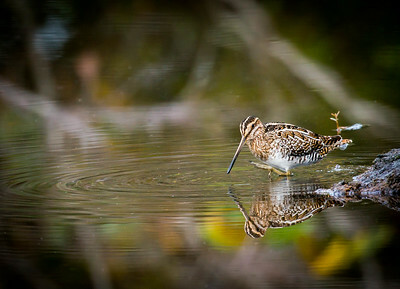 Captured with a telephoto lens. 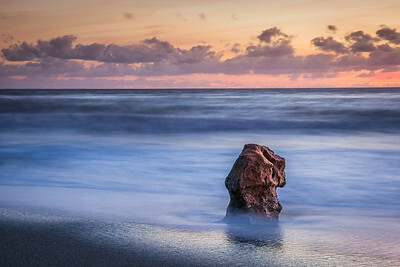 This surreal scene appears very much as it did that evening. Fishermen on a nearby bridge could be heard yelling to each other in amazement as the full moon rose above the horizon through the clouds. 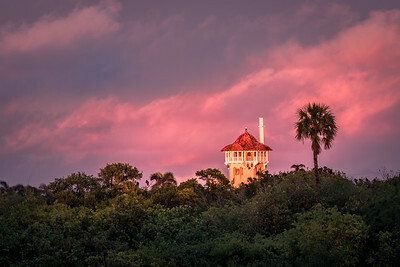 A unique sunset view of the tower on President Trump's Maralago Club property in Palm Beach, FL. 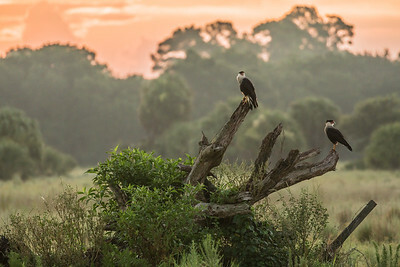 During the winter months large vultures like to soar above and roost on the Mangrove Islands just outside the estate. 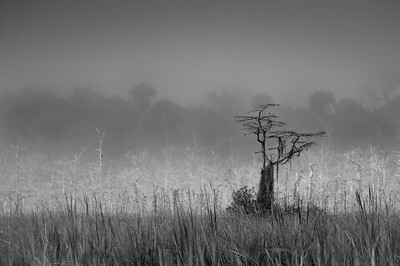 Here; Florida's wild natural world blends with the luxuries found beyond. 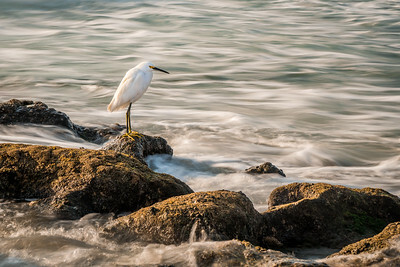 Snowy Egret on the hunt in swift ocean waters. 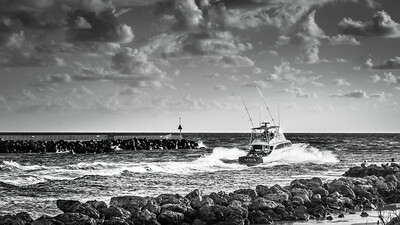 1969 Rybovich Sportfish exiting Jupiter Inlet, FL. Formerly "the Bull" owned by Bernie Madoff and returned to original name Apava after government auction. 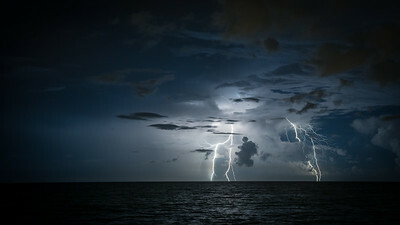 Thunderstorm sends multiple bolts to the Atlantic Ocean below. 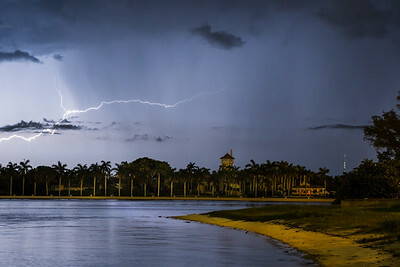 Very early morning lightning storm over the ocean with the Maralago estate in the foreground. 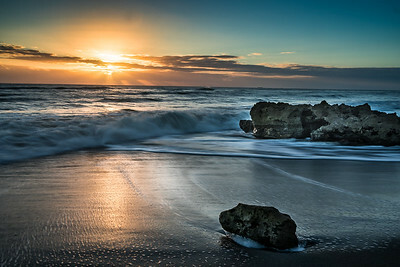 This is a view now made famous from frequent international news reports often broadcast live from this intracoastal beach. 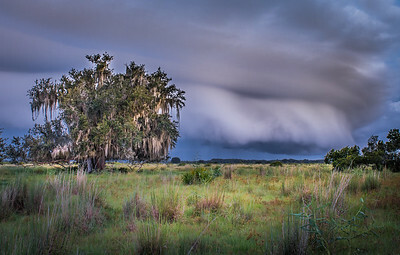 Fort Center, within the Fisheating Creek WMA, FL. 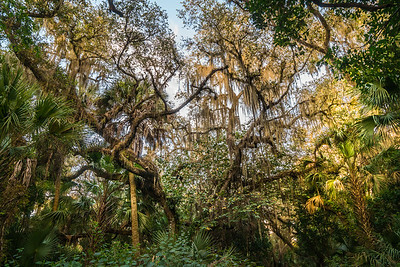 Ancient Native American earthen structures surround this nice trail through an oak hammock. Within the oaks are wild citrus trees possibly centruries old ansestors of trees bartered by natives from early Spanish explorers. 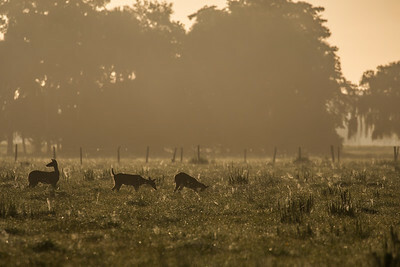 A slow shutter and slight lens zoom action give this photo a sense of walking through a 3deminsional scene- as the walk then takes a turn at the end. Excellent print when done on aluminum, will be sure to receive a lot of attention and comments. 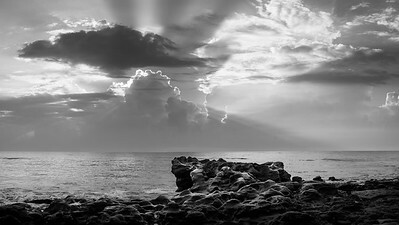 Walk into the rays of sunshine on this coquina rock beach outcropping. 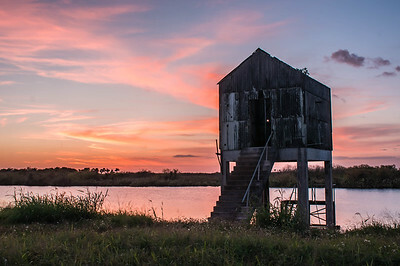 On the Lake Okeechobee rim canal, this old pump house was used to monitor water levels. 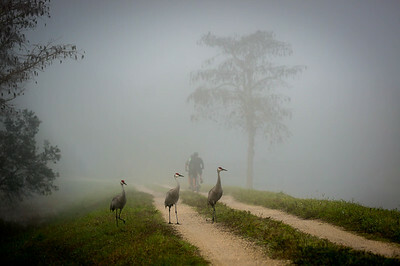 This trio of Sandhill Cranes personally greets early morning bike riders into their misty home one early morning. 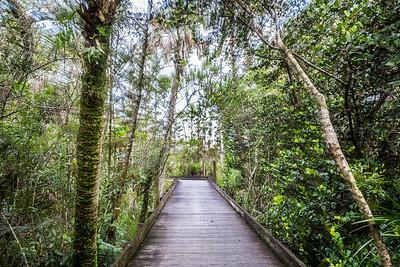 Grassy Waters Preserve, West Palm Beach. 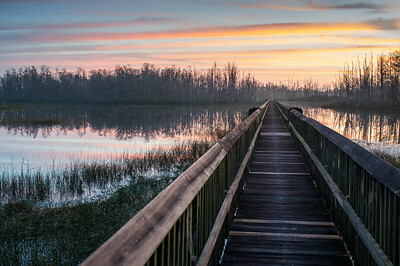 An expansive boardwalk through cypress swamps captured at sunrise. 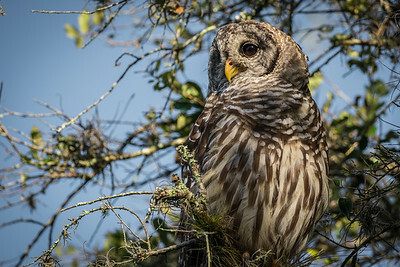 A typical obstacle are spider webs which provided dinner to the namesake the previous evening. 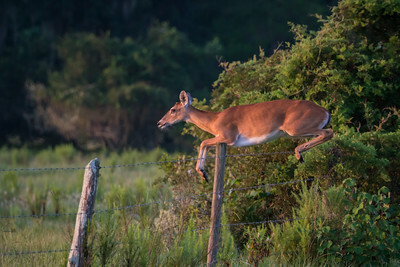 One such can be seen draping across the rails some distance into the scene as a greeting to the first morning visitor. These walks are also frequented by single track bike riders, whose tracks are well worn in the center of the boards.